A Fish Pudding 1/2 a lb of fish, beaten in a mortar. 1 gill of cream, 3 spoonsfuls of flour, 4 yolks of eggs, 1 spoonful of anchovy. Pepper and salt to your taste. It must be beaten up all together, & put into a mould & steamed for one hour, and served up with white sause. 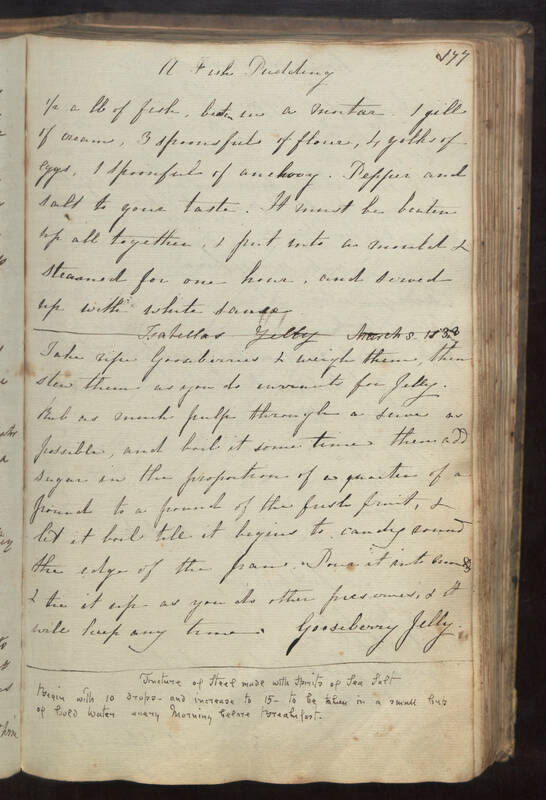 Isabellas Jelly March 5, 1838 Take ripe Gooseberries & weigh them, then stew them as you do currants for Jelly. Rub as much pulp through a seive as possible, and boil it some time then add sugar in the proportion of a quarter of a pound to a pound of the fresh fruit, & let it boil till it begins to candy round the edge of the pan. Pour it into moulds & tie it up as you do other preserves, & it will keep any time. Gooseberry Jelly. Tincture of Steel Made with Spirits of Sea Salt Begin with 10 drops, and increase to 15, to be taken in a small cup of cold water every morning before breakfast.